We have been getting in a lot of practice with the practice robot. The arm is faster now and we are getting better at controlling everything and stacking. We are very excited that Amazon now has these, so that we can stop buying green and yellow organizers. These seem to solve multiple of our problems with some of the other cases, and don't appear to come with any annoying stickers on the clear covers. We will be buying many of these throughout the year. We have began working on improving our FIRST $1000 document by adding on a FIRST $10,000 which is the idea of what tools would we buy if we were starting a new team and had $10,000 to spend on equipment. Hopefully this will help some teams find tools and equipment to get them started. This is still a living document so it may be updated regularly. 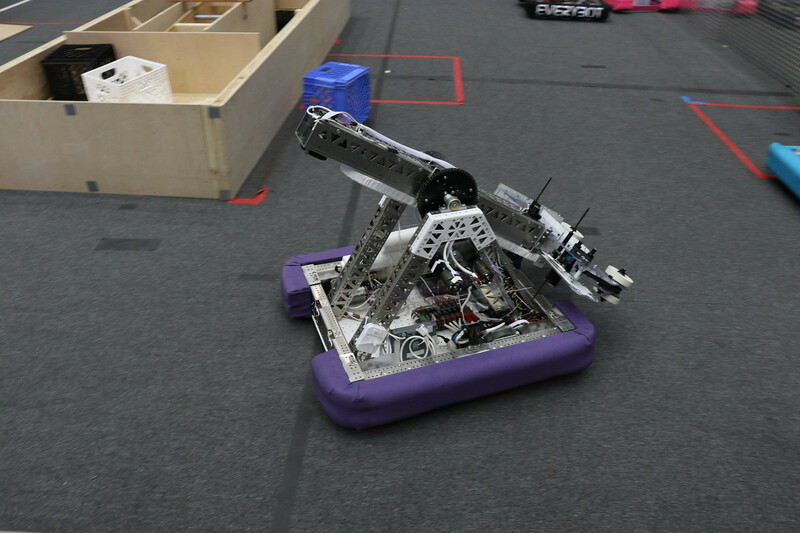 Quick update, the robot design has stayed the same we have just been finding things to fix and getting subsystems tweaked and ready. We compete next weekend (March 15-17) at the Lone Star Central Regional. It's nice that's its only a few hundred yards from our lab. Infrared will be ready for the big weekend and we are happy to be able to welcome so many of our friends to our campus for the competition. The tailgate is out for now, probably won't be made until after championship. It will be fun lifting partners in the off-season but for now we are going to focus on climbing around our partners. We got to take the practice bot to 118's shop the weekend after bag day. It was our first time driving it around the full field. It showed some promise, but it definitely need a lot of tweaks before it could reach it's potential. 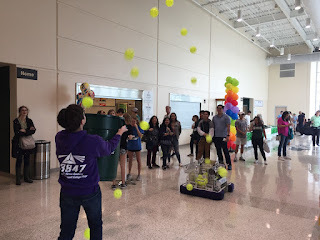 We split up this weekend with some of our team heading up to the Dallas regional to learn how the game is played and the other half staying at our school to run our Spring Fling Maker Faire and demo our robot. 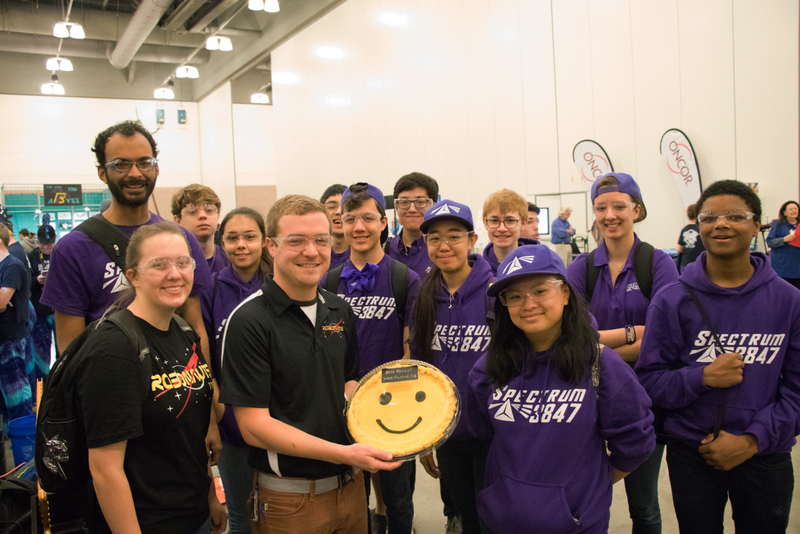 The Dallas regional is awesome we got to see a lot of friends including 118, 148, 1296, 2848, and 3005 who we won't get to play with this year until South Champs. Congrats to all those teams for awesome performances this weekend. We took almost 1500 photos at the event so if you're team was their or you just want to look at cool robots have a look through the gallery. 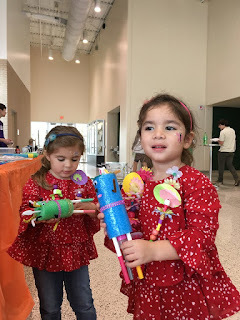 This was our 2nd Annual Maker Faire at our school's Spring Fling Scholarship Faire. We had fun demoing the robot, making art robots, and we also had a police robot to come demonstrate as well. The puncher tests have been going well. We should be able to shoot most of the first layer of cubes and it will also help speed up autonomous cube scoring. This game is about scoring cubes fast, it seems obvious but it's now backed up by match play. #NoParking, it's 5 points don't park for 30 secs when you could put more cubes in the vault or take the switch or scale for 5+ secs. Also don't park/climb all three when you have levitate, it makes you look foolish. Partner climbs seed you high they don't win you the event. It's only 30 points (compared to a solo climb) if it takes 30+ secs for 2 plus robots to do it, are their better ways to get those 30 pts during playoffs? If there isn't have you already won the match and now are you risking breaking something by dropping a robot? If we see partner climbs get way faster, this is a completely different story. Auto is king, again obvious but now backed up with actual match play. Defense will get interesting but like most years, very few teams will play it well and Einstein will still be won by the best offensive robots but smart defense can turn matches. Stopping a team from scoring a cube is almost as effective as placing another cube that keeps the scale/switch on your side for that same amount of time. Possibly more so if your scale plate is full. 7. All omni drive train seemed to work pretty well. On that note, Robots I liked this week. (Didn't watch a lot of video since i went up to watch Dallas)1. 7179 was an absolute blast to watch, very sad they won't be at champs. If anyone isn't happy with their robot and wants to rebuild I think this is the model. The thing weighed less than 60lbs, you could probably strip the COTS and carry the whole thing in as withholding. If every 3rd was like this robot, this game would be crazy. They scored 16+ cubes in at least one match. That number is breaking scouting sheets.2. 3538 Robojackets (played at Southfield district) built an awesome robot, we had sketched the side lift, with 180 degree wrist, early in the season and just didn't think we could build it. I'm very glad someone did and got it working well.